The first game of the 2017-2018 Season is Saturday week (7th October). Please have a read of the important information below. The committee would like to congratulate Balbir Singh on being appointed as the B Grade captain for the 2017-2018 season. The club is still looking for 2 Captains for the upcoming season. Please consider yourself for these important roles. If anyone would like to discuss any of these roles please contact myself on 0430 021 525. The Fees for playing Cricket at SRCC this year have been set as per below. Please take note of the substantial savings if fees are paid earlier in the Season. The club cannot function properly without players paying their fees in a timely manner. The committee encourages all players to pay their subs asap. Training Dates / Times leading up to the 1st Game – all training sessions @ The Cage. Thursday 5th October – 5:00pm – 1st Selection Night. Road Rage Issue 3 now available….. Click the below link to view. South Road IV were looking forward to playing in Round 2 after receiving a forfeit from Woodcroft in Round 1. They would be without skipper, Roger Nunn, who would be sorely missed and was a big loss. We’re all thinking of you, Nunny! Cricket Season is only 3 weeks away. Some important updates for everyone. As previously announced Paul Amato will lead the A Grade (Section 1) this Season. Luke Slattery has been appointed B Grade Captain (Section 3). 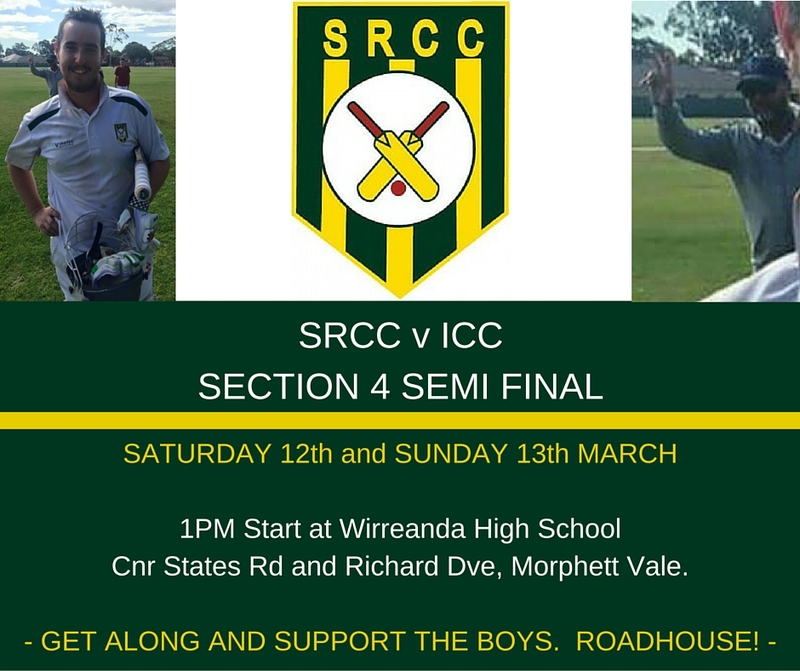 Roger Ross will lead the C Grade (Section 5) and Roger Nunn will again skipper the D Grade (Section 9). The 2016/17 season is fast approaching. Below is a list of training dates for the upcoming preseason. At the Adelaide and Suburban Cricket Association Meeting on Tuesday Night a motion was passed for 7 + 7 programming in ALL GRADES. 8 Teams per section which will increase the Total Number of Sections to 9. 7 x 1 Day Games programmed mainly around the Christmas / New Year period. Each Team will play every other team twice, 1 x 2 Day Game and 1 x One Dayer. At this stage it looks as though we will have Teams in Sections 1, 3, 5 and 8. After match drinks and presentations this Saturday night are at Edwardstown Bowls Club ” WESTERN” end of bar. From 7pm as it is a one day game, however should you finish early you can head back there and drink in their bar and please sit in the WESTERN end of their club room. This is the last match for many of us for the 2015/16 Season so make sure you get back and support your club. The thirds will play finals regardless of results this weekend. We will let everyone know where they are playing their finals as soon as we are advised. So get around them and show them our support for their finals campaign.